Police in Northern Ireland are to launch a murder inquiry into Bloody Sunday, where 13 people were shot dead by British soldiers in 1972. The investigation may involve up 30 police staff and could last up to four years. 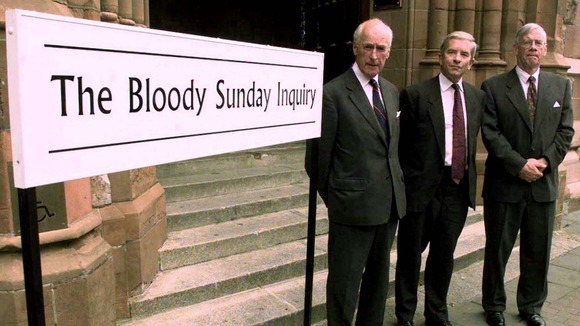 The probe follows the Saville Inquiry's report, which said civil rights demonstrators killed by troops in Londonderry at the height of the Troubles were innocent. A murder inquiry into the Bloody Sunday killings 40 years ago in Northern Ireland, could take years accordinG to PSNI chief constable Matt Baggott. As part of the Saville Inquiry papers were passed to the Public Prosecution Service (PPS) last November. The PPS have informed the police there were grounds for prosecution and a full criminal inquiry should follow. "I do not think anywhere else in the world is facing the challenges of organised crime, paramilitary activity ... alongside having to deal with 30 years of misery in such a way. This will be, and is already, a very long resource intensive investigation which does have implications looking forward to how we are going to be able to sustain this"